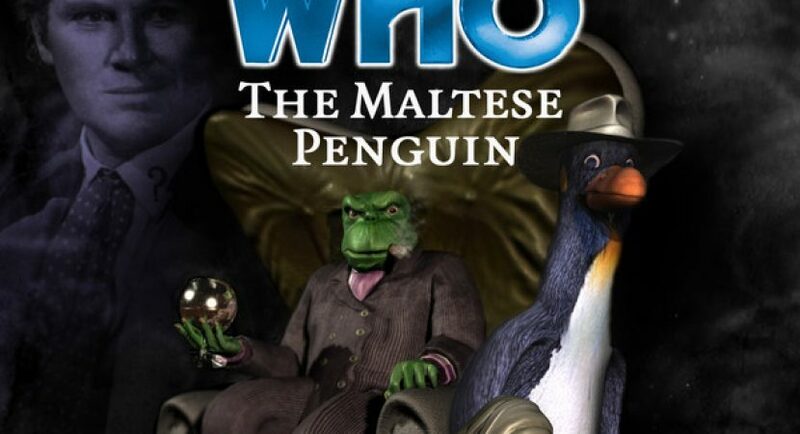 I finally got around to listening to this silly parody of The Maltese Falcon with lovable Frobisher and not enough Sixie. It was originally a subscriber bonus release— the first one ever, in fact— accompanying The Holy Terror, Rob Shearman’s surreal horror masterpiece in which the Big Talking Bird steals the show. Maltese Penguin has not aged quite as gracefully as Holy Terror, since it was only a freebie bit of fluff to begin with. I imagine most current Big Finish listeners will be unfamiliar with the old Six and Frobisher comic from Doctor Who Magazine fifteen years ago, making the comic strip nature of Six’s whifferdill friend a tough sell. (On the other hand, The Holy Terror was enough to give me a soft spot for him, so they might). Also, some of us philistines have never watched The Maltese Falcon in full, so we’re missing out on parts of the parody. But the genre is familiar enough: gumshoe Sam Spade, femme fatales, crime bosses, crooked cops, wall to wall clichés, and Bogart/Peter Lorre impersonations. Replacing Sam Spade with a shapeshifting penguin P.I. adds a ludicrous bit of fun to the proceedings. It’s even funnier when Colin Baker breaks out his bad American accent to join in. Thanks to shapeshifting shenanigans, there’s some brain-bleeding visuals when characters start locking lips. I won’t spoil it, but: gack! Missy’s first clench with Twelve was less awkward! For me, the parody didn’t have quite enough mileage to stretch to a full hour, and the villain’s Cunning Plan seemed a bit naff even by the standards of Pinky and the Brain. But as long as you don’t take this audio play seriously, it’s entertaining. Jezek’s Frobisher is endearing, and it’s great hearing Colin step outside his usual beaten path. Since they never got another audio together, I’m sorry this is the last: the Doctor is barely in it, and Frobisher is the main character. But now and then they check in with one another, and those are surprisingly three-dimensional little scenes. This audio belongs to an early, lighthearted, experimental time in Big Finish history, when it was closely aligned with Doctor Who Magazine, the comics, and that anything-goes period before the advent of the new show (not to mention epic series like Dalek Empire and Gallifrey) made Big Finish the more sober production studio is today. Somehow, despite almost no Doctor and a cast right out of Who Framed Roger Rabbit, it works. It’s amazing how flexible the vehicle of Doctor Who can be. Nowadays The Maltese Penguin can be purchased separately or selected as the “freebie” disc with a 12-disc Main Range subscription.